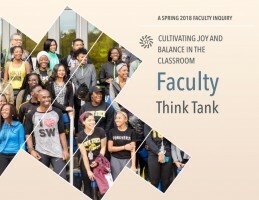 This semester-long Faculty Think Tank inquiry group is for faculty interested in cultivating community or having more fulfilling, meaningful experiences in the classroom. We will explore our agency to bring joy and balance to our work, consider the power of collective action, and co-construct pathways toward joy and balance. For questions or to RSVP, please email scholarsstudio@bowiestate.edu.